The opening week of the fantasy football season is in the books. There were some surprises, both good and bad. Injuries popped up to throw us some curveballs too. Let the overreacting begin! Don’t get stuck in the trap. Take your time to weigh through things carefully. The second-year quarterback put his cannon arm on display against a banged-up Chargers defense. He registered 256 yards and 4 touchdowns on 15-of-27 passing. Mahomes and speedster Tyreek Hill jibed well, connecting for seven receptions for 169 yards and two touchdowns. There are still likely going to be some rough patches ahead — matchups against the Steelers, 49ers, Broncos, and Jaguars are on tap over the next four weeks — but if Week 1 is any indication big things are in store for the Chief in 2018. It’s hard to imagine things getting any worse for the Titans in their season-opening loss. The game lasted over six hours due to weather delays as the team fell 27-20. On top of that, they saw quarterback Marcus Mariota (elbow) and tight end Delanie Walker (ankle) sustain injuries. Lewis was a bright spot. He carried the ball 16 times for 75 yards and pulled in five of his eight targets for 35 yards. He took a back seat early on to Derrick Henry but dominated the carries down the stretch, finishing with 21 touches compared to 11 by Henry. Tennessee could be playing from behind frequently in the weeks ahead and that game flow will definitely favor Lewis, who should be viewed as back-end RB2 heading toward Week 2’s matchup with Houston. After suffering a shoulder injury early on during the preseason, the hype train slowed down a bit on Kittle, but after one week of action it appears clear that some of the buzz surrounding him may have been warranted. 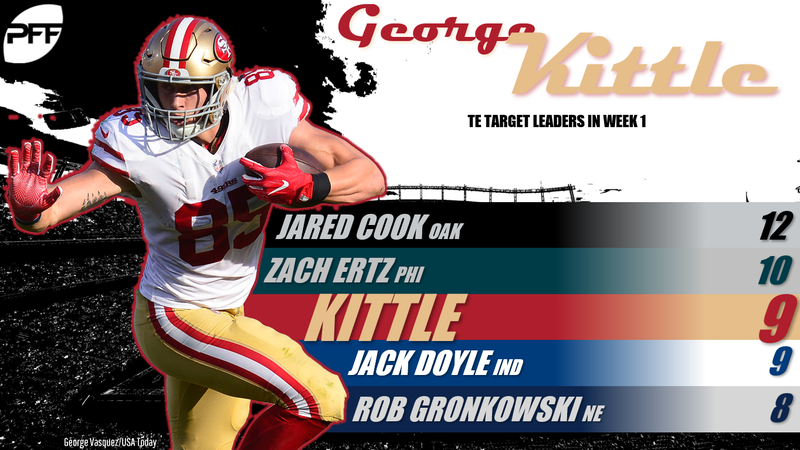 Only Zach Ertz and Jared Cook saw more Week 1 targets at the position than Kittle (9 targets), who finished with five catches for 90 yards against a very good Minnesota defense. The numbers could’ve been better too as he and Jimmy Garoppolo just missed on a couple of other would-be scoring plays. Regardless, Kittle clearly has good rapport with his quarterback and is someone that Garoppolo looks for in all parts of the field, especially in the red zone. Given the Week 1 injuries at tight end, Kittle could be a nice trade target. Only six signal-callers registered less than the 0.23 fantasy points per dropback Prescott produced in the Cowboys’ opening week loss at Carolina. He completed 19-of-25 passes for just 170 yards and no touchdowns while mustering only 19 yards on five carries. Prescott was also sacked six times as Dallas struggled to move the chains. The team’s weakness at wide receiver was badly exposed in the matchup. While he completed 76 percent of his passes, no quarterback had a fewer percentage of their passes be thrown deep (3.4 percent; only 1 attempt of over 20 yards). With no upside in his passing stats, Prescott will need to produce some serious rushing numbers to remain fantasy relevant in most formats in 2018. If Week 1 was indicator, owners shouldn’t be too optimistic. Johnson has made his mark in fantasy during his first three years in the league by averaging 62.7 receptions per season. In Week 1 against the Steelers he only caught one ball on five targets and mostly gave way to Carlos Hyde. He finished with five rushes for 17 yards and just one catch for eight yards despite playing 41 snaps. He did line up in the slot on three snaps and out wide on another play, but he mostly operated out of the backfield. More of that can be expected with Jarvis Landry now added to the mix. The offseason additions brought some definite buzz to the Browns, but they didn’t do much to boost Johnson’s fantasy value. He’s a risky flex option at best in PPR leagues heading toward Week 2. The Falcons’ offense sputtered most of the night in their opening-week loss at Philadelphia and Ridley was particularly disappointing. The rookie played on 45 snaps but was only targeted twice and failed to pull in a catch. Fantasy owners were expecting more from a player who was taken with the 26th overall pick in April’s draft. However, Ridley wasn’t the only rookie to disappoint. The 10 receivers drafted in the first three rounds in April combined to produce only eight catches for 133 yards and two touchdowns. Ridley may have been drafted in Round 1, but this year’s crop of receivers wasn’t considered that great of a class by many. He’s worth holding on to, but he’ll need to play his way in fantasy lineups and that could take some time to materialize. The undrafted rookie out of Colorado will be a hot waiver grab after he rushed for 71 yards on 15 carries and added another 31 yards and a touchdown on a pair of receptions. He touched the ball on 69.2 percent of his snaps (26), which was the highest rate for any back with 15 or more snaps. Denver plans to use a committee approach in the backfield and that will lead to inconsistency, but Lindsay’s stock is rising. Dorsett showed improvement from last season during the Patriots’ opener and was definitely efficient as he pulled in all seven of his targets for 66 yards and a score as he tallied 0.54 PPR points per opportunity. Opportunity works in Dorsett’s favor with New England thin at wide receiver and especially during the next few weeks while Julian Edelman is serving his four-game suspension. The former first-round pick of the Colts is trending up.